It’s that time of year again when ordinary, mild-mannered folk go loopy at the mere hint of a bargain. On Black Friday who amongst us can resist the thrill of wrestling with a complete stranger on the floor of Toys R Us to secure the last coveted Hatchimal in store? I’ll give you a clue – I can! When I was invited by Embrace Scotland and The Association of Scotland’s Self-Caterers to escape the consumer chaos and get involved in their new Paws for a Break campaign I jumped at the chance. 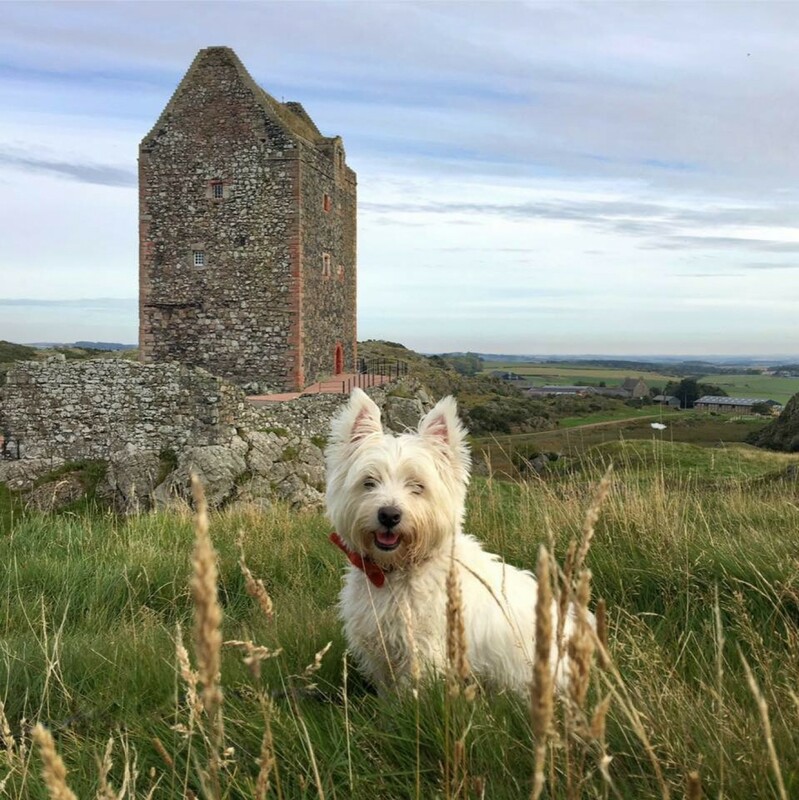 The campaign aims to promote Scotland as the perfect place to enjoy a dog friendly break. I’m clearly biased but in my humble opinion it’s THE perfect place to enjoy a dog friendly break. So, on Black Friday we left Edinburgh excited at the prospect of spending our weekend chasing sunsets, exploring castles, walking on the beach and crossing the Atlantic by bridge – no tills ringing, no bargain hunting, no stress. Luckily we didn’t have to wait long to bag a sunset. Halfway into our journey, and with the light fading fast we stopped at Loch Lubhair in Glen Dochart hopeful of catching something a wee bit special. What we caught was so beautiful it even impressed The Teen. Loch Lubhair was frozen, and Ben More which looms over it was topped with snow. The setting sun cast a gorgeous, warm glow on the magical, icy scene before us. It was one of those special moments that always make me feel incredibly lucky to live in such a beautiful country. The Wee White Dug who’s absolutely fascinated by snow and ice excitedly slipped around the edge of the loch like a stocky little Bambi, tail wagging ten to the dozen. Our home for the weekend was a cosy two bedroom lodge at Cologin Country Chalets & Lodges. Located in the remote Lerags Glen, 3 miles south of Oban it was the ideal place to escape from it all. The Barn, a country inn complete with roaring log fire and folk music was conveniently located on site. Serving home cooked meals using fresh local ingredients, it was perfect for lazy self-caterers like me! Even though it was the end of November the place was busy with locals and visitors, giving it bags of atmosphere and no flat, out of season vibe. We ate there both nights and all loved the food. The venison burger, Barra haddock, sea bass with chive mash, raspberry creme brûlée and banoffee sundae were some of our favourites. Mr G and I had another dabble with a whisky nightcap, just to keep the fear at bay and our hands in at cultivating an appreciation of our national drink. I chose The Classic Laddie by Bruichladdich and he went for Jura Superstition, deciding to play it safe after trying and not hating it during our last road trip. Next morning, embracing the whole self-catering experience, I cooked us a hearty Scottish breakfast of Puddledub honey and mustard sausages and bacon from Fife. Organic farm eggs from Ardersier and Stornoway black pudding all bought from Barnton Fine Foods our wonderful local deli. We also had fresh toasted farmhouse bread, haggis, tattie scones, fried mushrooms and tomatos. A veritable fried feast and bumper calorie bonanza! After breakfast, and with loads of great exploring options on our doorstep we made crossing the Atlantic was our first mission of the day. The Isle of Seil, one of a group of islands known as the Slate Islands lies 12 miles south of Oban. It’s reached via the 18th century Clachan Bridge which is often referred to as the Bridge over the Atlantic as it spans a narrow channel of the Atlantic Ocean which separates the island from the mainland. Over the bridge sits the Tigh an Truish Inn which translates as the house of the trousers. After the Jacobite defeat at Culloden in 1746 the wearing of kilts was banned. Islanders heading to and from the mainland stopped at the inn to change in and out of their forbidden kilts. I love this tale of defiance and courage after such a heavy and brutal defeat. We enjoyed the quiet calm of the morning, snapping way more photos of the quaint humped back bridge than was necessary, before heading off to explore more of the island. We stopped at the Luing ferry next and hummed and hawed about making the short crossing to the island. 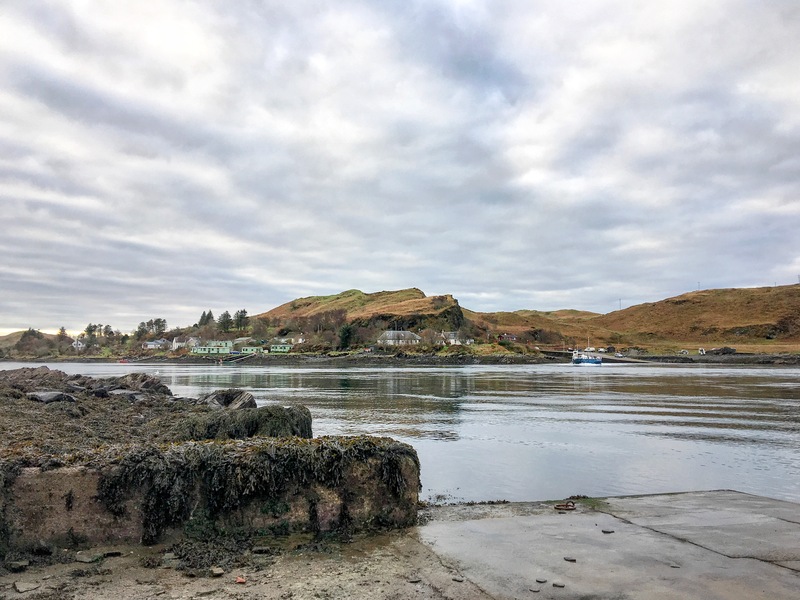 In the end we chose to admire it from Seil instead, deciding to return another time to do the Slate Islands more justice with a longer visit. The Isle of Seil’s main settlement Ellenabeich was our next stop. It’s here that the historical link between Seil and the slate industry becomes obvious. Even the water around the harbour looks slate grey, and there’s evidence of quarrying at every turn. Directly opposite, lies the tiny Isle of Easdale – which looks like a slice of Swiss cheese floating in the sea from above. Abandoned, and now flooded slate quarries have left a patchwork of water-filled squares dotted all over the island. 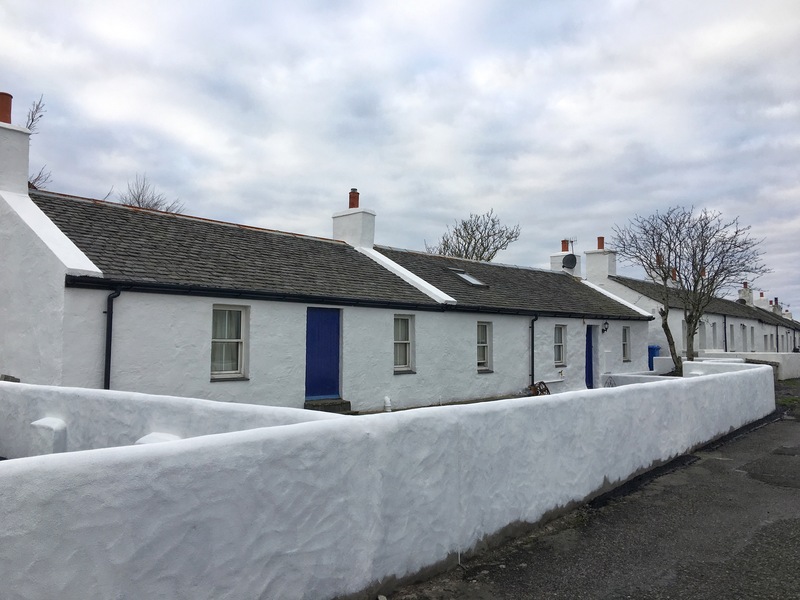 With so much slate quarried here during the height of the slate industry, it’s no wonder this group of small Scottish islands are known as the islands that roofed the World. We left the Isle of Seil tooting the car horn as we approached the steep, blind summit of the Clachan Bridge. Dunstaffnage Castle just outside Oban was our next port of call. The castle is a well-preserved and imposing medieval fortress which was once a stronghold of the MacDougall Clan. It boasts connections to some of Scotland’s most well-known historical figures including Robert the Bruce who captured it in 1308, and Flora MacDonald who was held here in 1746 after aiding Bonnie Prince Charlie in his escape. After a short while exploring, it was becoming increasingly obvious that The Teen’s mood was quickly deteriorating due to lack of food. It was midday, and 3 whole hours since her meagre breakfast! Not ready for lunch we ignored her angry eyes and paid the Falls of Lora a visit next. The falls were as calm as a millpond but the Connel Bridge looked lovely reflecting in the still water below it. It was hard to imagine anyone ever canoeing over rapids on that glass like water, yet the next morning when we passed the falls were in full flow. The Teen now clearly faint from hunger had irritated us sufficiently with her pathetic hangry face, so we stopped at the dog friendly Wide Mouthed Frog for lunch. A caffeine fix, some broccoli & cauliflower soup and a chip butty later we were all happy and ready for some more exploring. Keen to give the boy some off lead time, we took him to Ganavan Sands for a good run around. The beach has beautiful views across to the Isle to Mull. I felt a twinge of longing at seeing my favourite place so close, yet out of reach. The boy was in his element and picked his way across rocks like a mountain goat, looking for a good vantage point to soak up the fresh sea air. After a walk on the beach we headed back towards Oban and stood watching CalMac’s ferry the MV Isle of Lewis glide out-of-town, island bound. It left a powerful wake behind it. We noticed a giant craggy rock standing behind us, and when I realised it was connected to an old favourite of mine, Fingal of Fingal’s Cave fame I made a beeline for it. Known locally as the Dog Stone or Clach a Choin, legend says this is where Fingal chained his favourite dog Bran while he went off hunting in the Hebrides. Bran, frustrated to find himself trapped, circled the rock trying to escape. He circled so much that his heavy chain wore the base of the rock away. If you read my last blog about the beautiful isle of Arran you’ll know that the island also lays claim to a dog stone linked to Fingal and Bran. In reality, the stone is all that remains of a giant sea stack, now oddly stranded inland. We wanted to end our day out with some panoramic views so we headed up to Oban’s most iconic landmark, McCaig’s Tower. The tower sits high above the town on Battery Hill. Inspired by the Colosseum in Rome, and built using local Bonawe granite the tower was commissioned by wealthy Scots banker John Stuart McCaig at a cost of £5,000. Construction work began in 1897 and stopped in 1902 after McCaig died. McCaig’s tower isn’t Oban’s only great viewpoint though, there’s also Pulpit Hill and as the sun hadn’t set yet we hurried there hoping to catch our second sunset of the weekend. Pulpit Hill takes its name from a tall rectangular stone on the summit known as the Minister’s Stone. It’s thought that outdoor sermons were once preached there. As we admired the view the mountain Ben Cruachan could be seen glowing like fire in the distance, as the fading sun began to set on it. We caught our sunset too, and although more subtle than the one from the night before it was still lovely. Back at our lodge we freshened up and headed to The Barn for dinner, hungry after a long day spent outdoors enjoying the sea air. The night was cold and clear and the sky twinkled with thousands of stars. Nothing beats a dark sky to make the stars pop out. We’re lucky here in Scotland as we have lots of excellent dark sky spots. Inside The Barn had suffered a power cut, knocking out the lights. Thankfully the kitchen was unaffected so we ate our dinner by candle light beside a roaring log fire. The atmosphere was lively and everyone sounded really happy. It seemed that like us, our fellow diners didn’t miss electricity one little bit. We dubbed it Black Saturday and decided that unlike Black Friday, Black Saturday was a whole lot of fun. We were sorry to leave our calm little haven behind to return to city life, so to prolong our mellow mood a while longer we took a short detour to Kilchurn Castle on Loch Awe to gaze in wonder at how utterly fan-blooming-tastic it looked, reflecting a perfect parallel World onto the loch – simple pleasures. I’d like to extend a big thank you to the lovely Emma at Embrace Scotland for inviting us to review an Embrace Scotland property, and also Linda and Jim at Cologin Chalets & Country Lodges for very kindly hosting us. While our accommodation was provided on a complimentary basis all opinions contained within this post are entirely my own. I would love to take exciting landscape photographs – if we actually had the landscape. A massive 80 % of everything around us in saltbush. The photographs I have posted were all taken – still in South Australia – over 640 miles from here. From here to the nearest town east, 80 klms / west 114 klms / north 800 klms / south the sea. South Australia covers 984,377 square kilometers, larger than France or Germany with Dear Scotland 80,077 square kilometers. Where I live is not too far from the desert and the landscape around us is flat and generally featureless and not even good farmland. I look forward to your posts and the photographs of home and – of course – The Wee White Dug. Thank you. So glad you enjoy. I’d love to visit Australia some day. It sounds like a fascinating country. So vast compared to Scotland where you only have to drive a short while for a drastic scenery change. Overall Australia is a massive country and a fabulous country – incredible landscapes. Not so much here. It has its own features but there is only so much beach and foreshore photographs you can take. I00 miles south-west of here and it’s a different story — TeeHee they have a green stuff there. I think it’s called grass…. Sensational as always. Must go visit! Love the blog & the photos as always. One of my favorite parts is: Over the bridge sits the Tigh an Truish Inn which translates as the house of the trousers. After the Jacobite defeat at Culloden in 1746 the wearing of kilts was banned. Islanders heading to and from the mainland stopped at the inn to change in and out of their forbidden kilts. I love this tale of defiance and courage after such a heavy and brutal defeat. Wow! Can can anyone not love history?! Thank you – you need to visit. It’s been years since I was on the Isle of Seil so it was lovely to see it again and spend some time exploring.